Andrew Osmond on what’s chopped and changed in international animation. 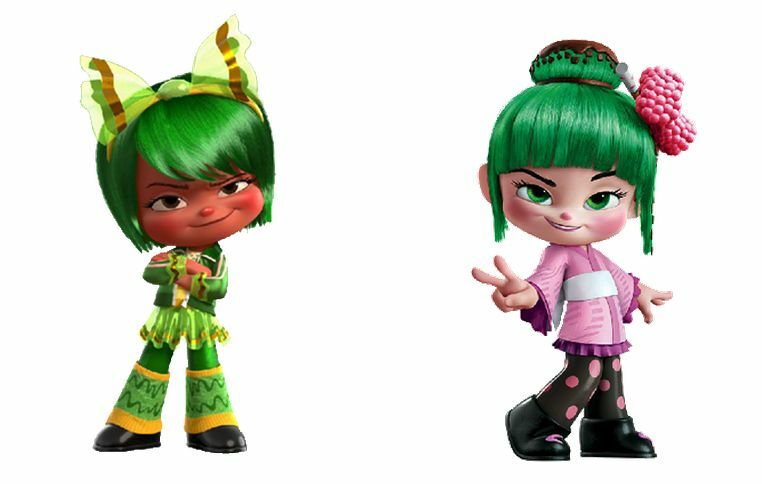 Recently on this blog, we reported on how DreamWorks’ new film Kung Fu Panda 3 had been re-animated for China, lip-synching the characters to the Mandarin-speaking actors. It’s a reminder that animation isn’t an unchanging, iconic medium; it’s malleable and fluid. Of course, the same is true of live-action film, as any fan of Brazil, Blade Runner or The Wicker Man could tell you. 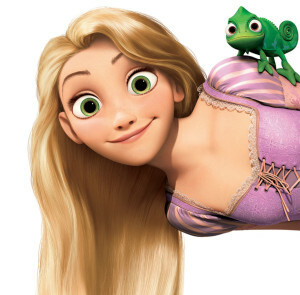 But animation can warp and mutate in its own strange ways, and did so long before CG pandas. Animated films have always been altered for local markets. Most obviously, voices are changed, sometimes even between English-speaking territories. For example, in DreamWorks’ Shrek 2, two minor characters were voiced by celebs Jonathan Ross and Kate Thornton in Britain, swapping out Larry King and Joan Rivers in the US. Similarly, Lightning McQueen’s agent in Pixar’s Cars is voiced by Entourage’s Jeremy Piven in the US version and Top Gear’s Jeremy Clarkson in the UK. You can transform a cartoon completely by changing the voices. Witness how France’s Le Manege Echante became Britain’s Magic Roundabout, thanks to an entirely new British script and narration by Eric Thompson. 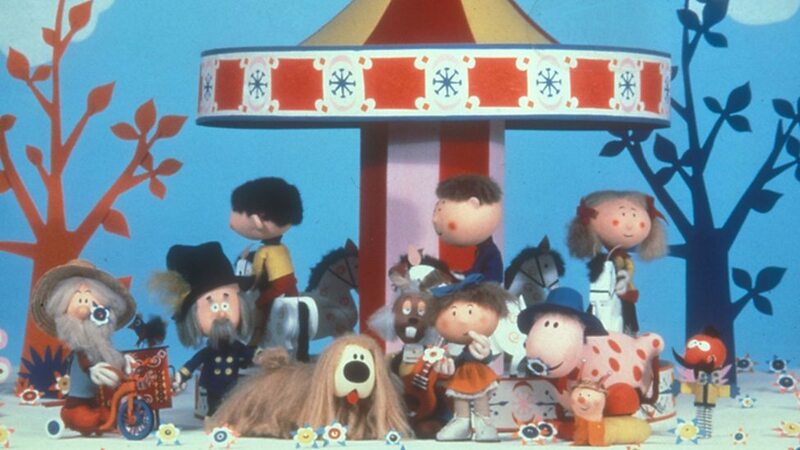 The process was repeated – disastrously – when a CG Magic Roundabout film was revoiced in America as Doogal. You can compare the trailers here (Britain) and here (America). The British version had so-so reviews; the American version scored 8% on Rotten Tomatoes. Sometimes it’s not just the voices that change, but the characters. For example, in the Japanese version of Disney’s Wreck-it-Ralph, a background character called Minty Zaki (pictured) was specially remodelled as Minty Sakura. You can spot her at 1-04 in this Japanese trailer. Disney went further in its new film, called Zootopia in the US and Zootropolis in the UK. Reportedly, it offers up a menagerie of variant animals to read the news, including a tanuki in Japan. There are smaller cartoon variations that viewers may not notice. In the British release of Pixar’s Ratatouille, set in Paris, the onscreen writing is in French; in the American release, it’s English. These days such changes are easy to incorporate, but it used to be hard work. Back in 1945, the pioneering Japanese animator Tadahito Mochinaga found himself in Soviet Manchuria. One of his jobs was ‘localising’ a Russian cartoon, where a dancing cow writes the title with a brush on its tail. A Chinese title needed to be substituted, which meant the sequence had to be re-animated. Many changes were far deeper. 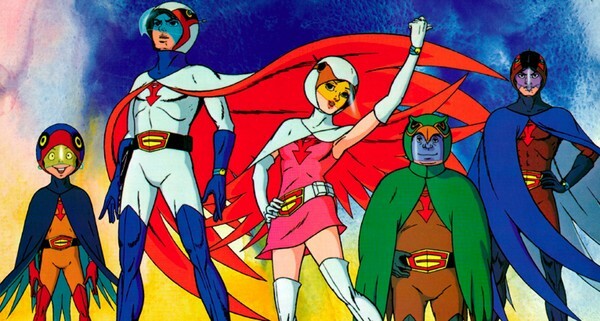 This video compares a scene from the 1972 anime Gatchaman to a bowdlerised version in America’s Battle of the Planets. Battle turns a downbeat ending into a happy one, slicing out footage and adding animation featuring the robot 7-Zark-7, who didn’t exist in the original anime. Later, America’s Robotech series strung together three unrelated shows by Gatchaman’s studio Tatsunoko: Macross, Southern Cross and Mospeada. None of the individual series were long enough for American syndication, but Robotech was; America’s Voltron was created the same way. The broadcast version of Cardcaptors in America (on the Kids’ WB channel) cut out the first seven anime episodes to have Li appear in episode ‘one’ of the show. A similar stratagem was used on the Fox Kids broadcast of Vision of Escaflowne around the same time. In the Japanese version, part one of Escaflowne was rather ‘girly,’ based round the heroine’s high-school crush. The Fox version skips that to start with part two, with the schoolgirl whisked to a fantasy world, and the reasons why she got there reduced to a flashback. Anime Limited will release the full version of Escaflowne soon. Changed TV title sequences are another sign of gendered marketing trying to pull in the boys. Escaflowne opened like this in Japan and this in America. A later show, the French-Japanese Oban Star Racers, opened like this in Japan (and on some foreign releases), but was pumped with testosterone for the US version. The issue became more widely-discussed when Disney’s film Rapunzel Unbraided had a name change to Tangled. Quoted in the Los Angeles Times, Disney Animation President Ed Catmull said that otherwise, ‘Some people might assume it’s a fairy tale for girls when it’s not.’ For presumably the same reason, Disney’s The Snow Queen was renamed Frozen. In principle, there shouldn’t be many examples of ‘lost’ animation scenes. Creating animation isn’t always expensive, though Hollywood cartoon movies like Kung Fu Panda are extremely expensive. But even cheap animation is time-consuming, and it’s in everyone’s interest to make as little as possible. Live-action footage is knocked into shape in the cutting room. In animation, the shaping and editing is done before people start animating. Stories in animation are hammered out in rough storyboards, to catch the unnecessary scenes and story fat. Storyboards are where you find strange early versions of familiar films, some sadder or more sinister than what ended up on screen; consider these lost scenes from Disney’s Pinocchio and Lilo and Stitch. Sometimes they’re created as scripts rather than storyboards, especially in TV cartoons. If you remember the 1980s Dungeons and Dragons cartoon (which was animated for hire by Japan’s Toei Animation) and wonder if those kids ever got home, check this unmade script by writer Michael Reaves, who went on to Gargoyles and Batman: The Animated Series. Nonetheless, there are some animated deleted scenes. Most of them turn up in films, which don’t have a predetermined time-slot. However, The Simpsons seems to have many deleted scenes for a TV cartoon; perhaps they’re less wasteful because fans will buy them on other formats. A soup-eating scene from Disney’s Snow White was dropped before it was painted. A lengthy sequence from Disney’s troubled The Black Cauldron was partly animated, then scrapped. Among CG cartoons, check out this trailer for DreamWorks/Aardman’s Flushed Away, which shows two characters – the hero’s hamster butlers – who don’t appear in the final picture. Another ‘erased’ character (a female sloth) appears in this deleted scene from the first Ice Age. 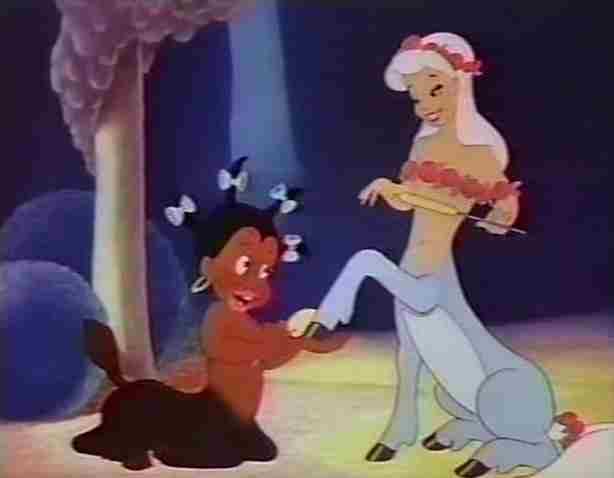 The most infamous ‘erased’ animated character, though, is Sunflower, a black centaur character who appeared in the original release of Disney’s Fantasia. In this video, the unexpurgated scenes are on the left; the modified scenes on the right are used in releases of Fantasia today. It should be obvious why Sunflower had to go; Fantasia was released in 1940, a year after the plantations of Gone with the Wind. Many short cartoons of the time were arguably more offensive, and were simply removed from circulation – see this entry on the “Censored Eleven,” not including other banned cartoons like this anti-Japanese tract. Numerous other American cartoons were similarly censored or pulled from circulation. For example, a Ralph Bakshi TV version of Mighty Mouse caused a scandal thanks to one particular image. In 2000, the feature Batman Beyond: Return of the Joker was heavily censored after the Columbine school tragedy. You can see how one crucial moment – spoiler! – was entirely re-animated, from this (2-30 onward) to this (1-40 onward). However, the original version was allowed onto DVD two years later. Animation censorship came to wider attention with the release of adult anime outside Japan. In Britain, some anime fans tracked the censored titles – there’s a list here – from video nasty fare like Overfiend and Violence Jack through to Satoshi Kon’s acclaimed Paranoia Agent (which lost an 80-second sequence of a girl merrily trying to hang herself). In the case of Ninja Scroll, cuts made to a 1995 video were waived in 2004. A 1995 video of Wings of Honneamise had a short scene removed, specifically to get a PG; the scene was restored in Anime Limited’s 15-related release last year. The Honneamise and Ninja Scroll cuts both involve sexual assault. Lastly, animation can be upgraded and director’s-cutted. Disney’s Beauty and the Beast was reissued in 2002 with a lengthy new musical sequence, and later converted to 3D. Other animations have had retrospective 3D releases, from Toy Story to The Nightmare Before Christmas. Adult American cartoons (Family Guy, Robot Chicken) have had extended versions of broadcast episodes released on DVD. Hey, I don’t know if Andrew is going to read this comment, but is there any chance anyone knows where his interview with Jocelyn Hamilton regarding Cardcaptors was published? There are a few comments from KidsWB representatives on the interview, but I’d love to hear something direct from Nelvana. Obviously, this is all well in the past, so I understand if it’s long gone. (On the shift away from Sakura towards the characters as a team) ‘We bring Li, the main boy character, more into the limelight. After all, he has powers too. And beyond the main characters, we stress this is a team show. Thanks so much for the response Andrew! I’m from Canada, so digging up a 17-year-old small print British magazine would’ve been pretty difficult, haha. What’s really puzzled me about Cardcaptors is how dramatically the packaging differed per broadcast market. The U.S. received the most heavily altered version of the show; compressing the storyline to just 39 episodes, whereas Australia, Canada and the United Kingdom received the full 70 episode series. Even more bizarre is the variations between. 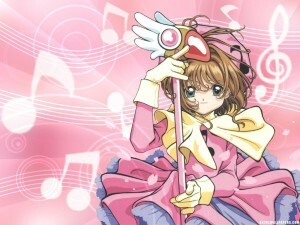 Australia, in particular, received what could be considered an alternate take, with a strange number of script and voice performance variations (https://www.youtube.com/watch?v=TvPk2foK9Tg) and even dubbed versions of the Japanese theme music (https://www.youtube.com/watch?v=ovKqt8My-IE). I’d love to one day know why all of this happened, but it’s been so long that the people behind it have likely forgotten or are big wigs that are unreachable. Jocelyn Hamilton, in particular, is now head of eOne Canada. The comments she gave you do align with some of the statements I’ve read from KidsWB employees, indicating they had a significant degree of control over the production. Sorry for boring you with all this nonsense about a children’s cartoon from nearly 20 years ago, haha.